In this review we line up some well known Lithium batteries from some of the leading manufacturers Simpliphi and Pylontech against the latest deep-cycle lead-acid batteries. Lead-acid battery technology has advanced in recent year’s with new high performance tubular Gel batteries from companies such as BAE and lead-carbon batteries from Narada. A direct comparison is not easy as each battery type behaves differently depending on the rate of discharge, depth of discharge and cycle life required. The full battery comparison criteria is explained in the detailed complete solar battery review. Lithium batteries used for home energy storage applications generally use lithium iron phosphate (LiFePO4 or LFP) cells in a tubular form, although there are some well known manufacturer’s such as Tesla and LG chem which use Lithium NMC cells. For this review we will focus on the Lithium LFP from the US manufacturer Simpliphi and the popular Chinese manufacturer Pylontech. As a general guide lithium LFP based batteries are designed to be discharged up to 90% total capacity while the traditional lead-acid (gel & AGM) batteries are generally not discharged lower than 50% unless in emergency backup situations. The advanced tubular gel and lead-carbon batteries are more durable and can sustain greater depth of discharge compared to standard gel and AGM batteries with up to 70% depth of discharge available on a regular basis but this will still reduce battery life significantly. This review does not include unsealed or flooded lead-acid batteries as they require high levels of maintenance and any cost savings can be outweighed by regular maintenance work required throughout the life of the battery. As highlighted in the full solar battery review lithium batteries have many advantages over traditional lead-acid especially in regards to usable capacity, weight, storage space and life cycle performance. However for larger off-grid systems lead-acid batteries are still one of the most trusted options as they are a well proven technology and a correctly designed system typically can last 10-15 years. Deep cycle lead-acid batteries have been around for decades but more recently advanced tubular gel deep cycle batteries have taken lead-acid further with up to 15 year life with no servicing. There are now many well established companies producing very high quality tubular gel lead-acid batteries, such as Sonnenschein, Hoppecke and TAB, but we selected the well known German BAE solar PVV battery to represent the sealed lead-acid batteries. The Simpliphi PHI range of Lithium Ferro Phosphate (also know as Lithium Iron Phosphate or LFP) batteries are rather unique in the home battery market being one of the only fully modular battery systems available. Unlike most residential lithium battery systems which are a fixed capacity or limited to 2-4 modules in parallel the PHI range is fully scalable and only really limited by the inverter and solar array capacity available. 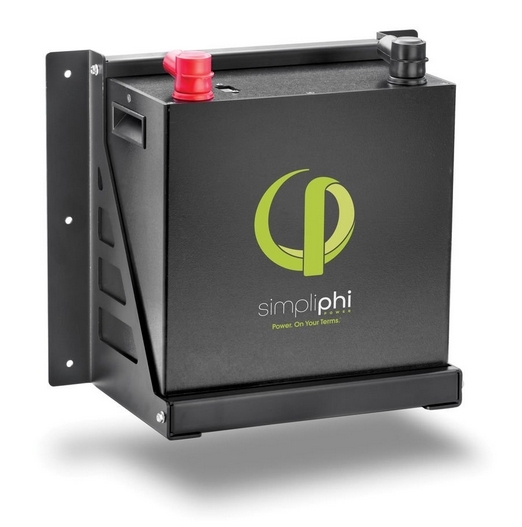 With the built in BMS or battery management system in each battery Simpliphi claim the PHI batteries do not require ventilation, cooling or thermal regulation. Considering Lithium LFP is the most stable lithium chemistry available and the proven track record, the PHI range appear to be one of the most robust battery system available on the market and are one of the only 'drop in' replacements for lead-acid batteries. SimpliPhi also offer the best warranty of any battery on the market with an impressive 10,000 cycle / 10 year warranty (at 80% DOD) and a 3500 cycle / 10 year warranty at 100% DOD. However like all battery warranties there are conditions, in this case they main warranty conditions are the battery operating temperature range (0 - 43 degC) and charge /discharge rate no greater than 1.6kW (PHI 3.4battery) as specified in the warranty document. Warranty is 10 years - See warranty certificate for more details. The Pylon Technology lithium ferrous phosphate (LFP) batteries were some of the first lithium batteries available which enclosed both the lithium cells and battery management system in a simple rack mounted unit. The first generation Extra2000 was replaced by the US2000B which has many improvements and more robust battery cable connections. The US2000B is the same size 2.4kWh module (previously with a touch screen interface) which allows easy setup and monitoring together with connections for multiple units in parallel. PylonTech also supply higher voltage modules for commercial applications. The pylontech battery modules are often re-branded and used by several large solar manufactures and distributors including SolaX, Canadian Solar and Redback Technologies. Lithium ferrous phosphate (LFP) is generally considered the most stable of all the lithium battery chemistries especially at elevated temperatures above 40 degC (common in Australia) which is highlighted by the high battery cut-off temperature of 50 degC. Cycle life is also quite high at a claimed 6,000 cycles at 80% depth of discharge, although it is unknown what the end of life (EOL) retained capacity is after this number of cycles? The warranty is for 5 years and specifies 60% EOL capacity with the extented 10 year warranty. Note the previous warranty states no more than 360 cycles per year. Based on this the new battery performance will remain the same and we can assume 3,000 cycles at 80% DOD. The battery module operates at the nominal voltage of 48V and now has a higher peak power output of 5kW (previous model was 2.2kW) over a short discharge duration of 60 sec. The updated US2000B battery retails at the same price as the previous Extra2000. BAE Gel Secura batteries are high quality German made lead-acid based batteries designed specifically for off-grid and hybrid installations. BAE manufacture a wide range of batteries of various sizes and voltage configurations but for this review we will focus on the Gel Secura PVV solar (tubular Gel) range. BAE have been manufacturing lead-acid based batteries for more than 100 years and the latest Gel Secura PVV battery design uses an advanced tubular-plate electrode with woven polyester gauntlet and solid grids in a corrosion-resistant lead-calcium alloy. The fully sealed maintenance free battery design utilizes the VRLA technology and have been proven to perform in harsh conditions and elevated temperatures. **Unlike Lithium based batteries Continuous and Peak power output of a lead-acid battery bank depends on battery capacity chosen, up to (235kWh @ 48V) and so power output could be rated as high as 100kW. Battery efficiency known as round trip efficiency is the charging and discharging efficiency or losses during use. Due to the laws of physics the transfer of energy from one source to another results in some energy losses. Generally losses from lead-acid batteries is 20% while most new lithium based batteries can be as low 3-4%. Another problem with lead-acid or lead-carbon battery systems is the long charge time required compared to lithium systems. The Lead-acid charge cycle can take several hours which means during bad or intermittent weather the charge efficiency will be very low and a full charge may not be achieved. In contrast Lithium batteries can charge very quickly (1 - 2 hours) and can efficiency absorb charge at much lower rates. Weight isn't always a huge issue for many installations but if space is limited then lead-acid battery banks are extremely heavy and require special racking systems for small areas. Space can be a problem though and lead-acid batteries can take up a considerable amount of room plus require ventilation and airflow to allow any trace gases to escape during charging and keep the batteries cool in higher temperatures. On the other hand lithium batteries have a much higher energy density and thus require much less space, however the biggest advantage is that lithium battery modules do not vent any gases during charging and so do not require the same amount of ventilation. This means they can also be stored in most non-habitable rooms or garages without any concerns. Also lithium batteries have individual monitoring systems which monitor temperature so confined spaces and over-heating are generally not a problem.